History, Architecture -- John Jay Homestead - Are We There Yet? The Jay House is currently closed for renovations. Of all the nation's founding fathers, John Jay held more high offices than any other. Interrupting his law practice in 1774 to serve as President of the Continental Congress, Jay then went on to become Minister to Spain during the Revolution, and Secretary of Foreign Affairs under the Articles of Confederation. With Benjamin Franklin and John Adams, John Jay was the author and key negotiator of the Treaty of Paris ending the Revolution. He was appointed the first Chief Justice of the United States Supreme Court, and later became Governor of the State of New York. He also wrote that state's first constitution in 1777 and produced, with Alexander Hamilton and James Madison, the Federalist Papers that helped convince the voters of New York to ratify the United States Constitution. 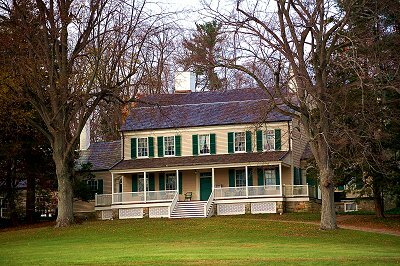 The Homestead, where John Jay lived his last 28 years, is a beautiful estate that originally comprised over 900 acres. The farmhouse that Jay had remodeled in 1801 was again enhanced by the addition of a large west wing in 1926 by Eleanor Jay (Mrs. Arthur) Iselin. Today, the house is largely furnished with original items used by the Jays at the Homestead. The Jay family is still an almost tangible presence in the house which it occupied for five generations. Tours of the house will be enjoyed by anyone who appreciates American history. In addition, special events throughout the year (such as an Antique Auto Show, Puppet Show, Concerts, and more) provide great outings for the entire family. A program for School Groups, grades 4 through 12, (up to 55 students) consists of a one hour tour that includes a teachers information and an activities package. This guide can be used before, during, or after the tour to help students better understand the the times immediately following independence, and the efforts it took to unite a new nation. Hours: House is open for tours Saturday - Wednesday 10am - 4pm (except Easter and holidays). Closes at 3pm November - March. Gallery is open Sunday, 12pm - 2pm and Monday 10am - 12pm. Grounds and Garden are open year-round, 8am - 6pm. Group Reservations: At least 4 weeks in advance. Morning tours are usually booked 8 - 12 weeks in advance. Directions: Located on Rt. 22. Take I-87 North to I-287 East to I-684 North to exit 6. East on Rt. 35 to Rt. 22. South on 22 for 2 miles. 1 hour, 15 minutes north of the George Washington Bridge.